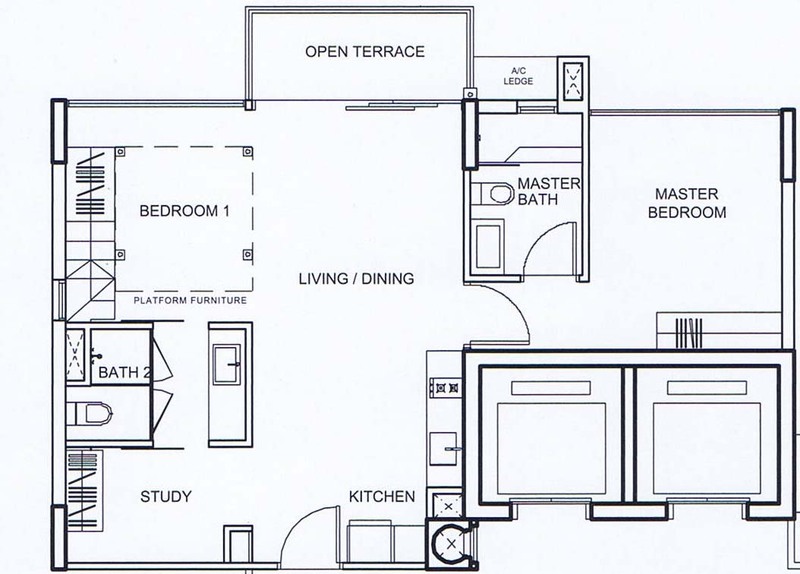 This SOHO units at Watertown come in both 2- and 3-bedroom variants. However, the wife and I prefer the later, which is about 807sqft. 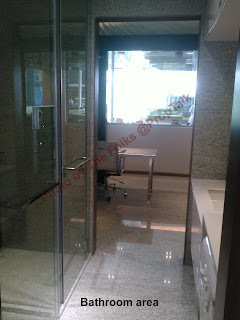 Below are photos that we took of the showflat. 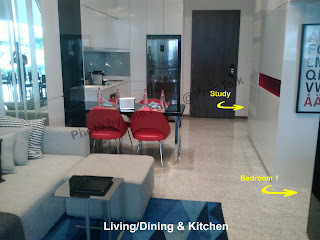 The living/dining/kitchen area is surprisingly spacious for an unit of about 800sqft. 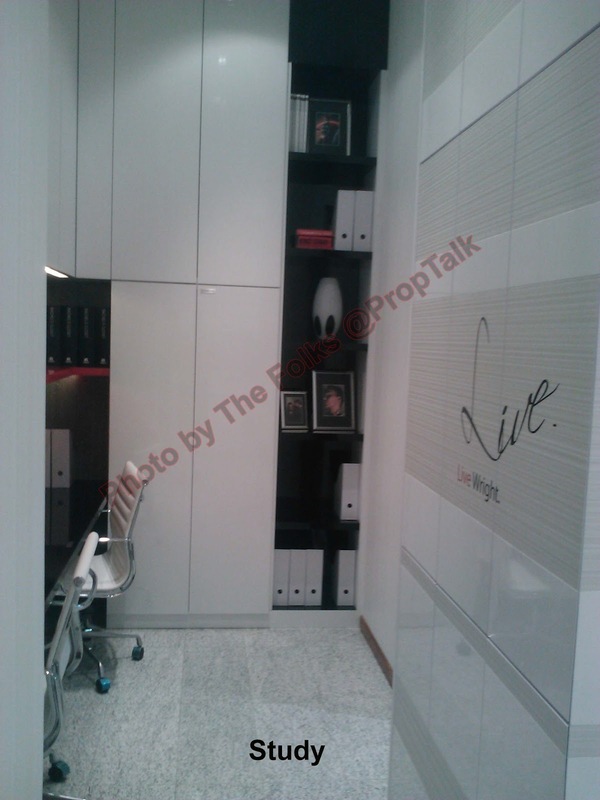 We love the functional design of the Study. However, it will be a tad difficult to reach the top-most shelves without support, given the 3.4-metre high ceiling! The bathroom and WC come in separate cubicles, which we like. 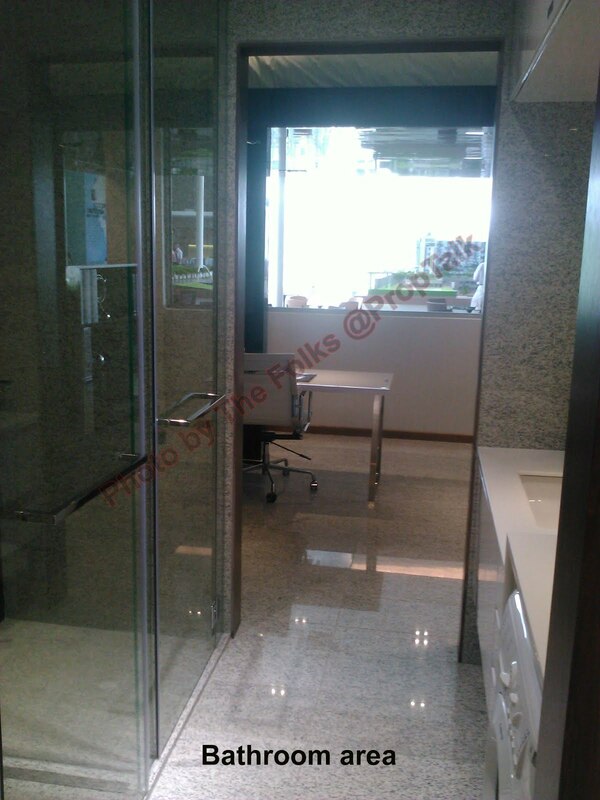 However, the transparent glass partition-wall between/around the two cubicles should probably be frosted so that two people (who may not wish to look at each other bathing and peeing respectively) can utilize the facilities privately. 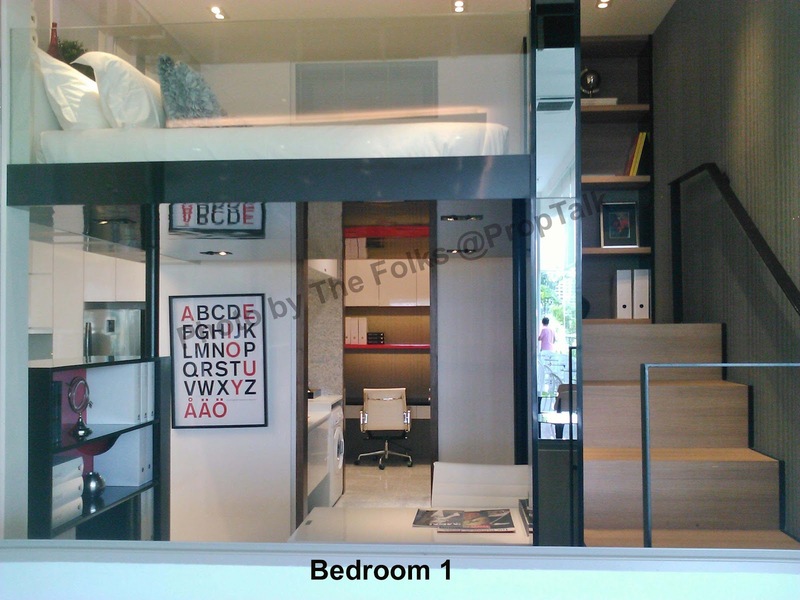 The "common bedroom" is elevated by a raised platform, which means you can have a separate office area below the bedroom. However, those more than 1.7m tall should probably take care when climbing into bed. The master bedroom is surprisingly spacious and can easily fit a King-sized bed. 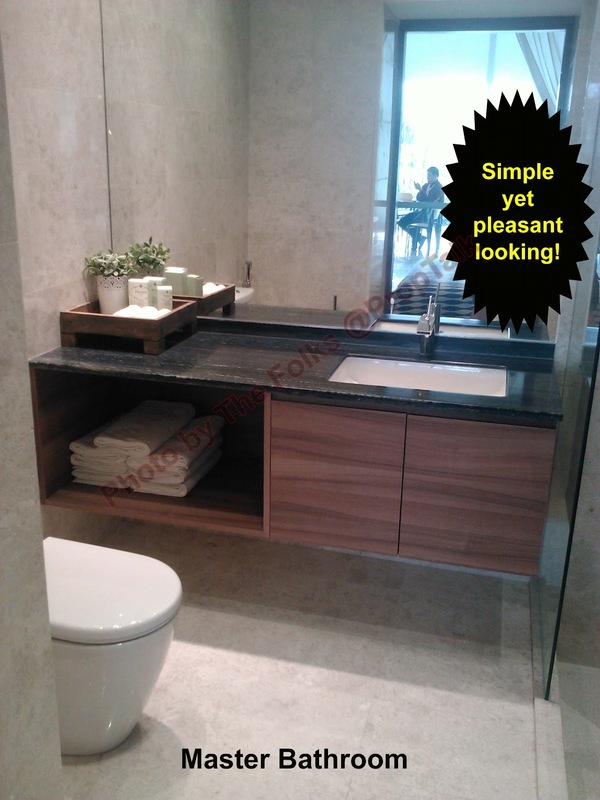 The master bathroom has a rather simplistic design but is rather pleasing to the eyes. All the floors/walls are marble. Overall speaking, the 3-bedder SOHO looked way more spacious than its size seemed to suggest. Maybe the high ceiling has something to do with this, but we reckon it is also due to the compact design that maximizes space. 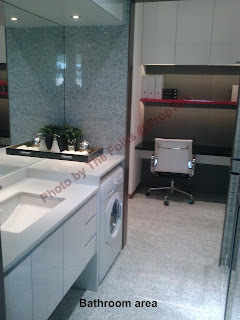 Price wise, the list price for this unit type (applicable during our visit last week) was about $1,299,560 ($1,610psf). After all applicable discounts, the nett price was $1,067,703 or $1,323psf. 7 comments to ''Watertown: 3-Bedroom SOHO (Photo Review)"
Price on the high side. hi u mentioned this is 3 bedder unit.. but where is the 3rd bedroom in the floor plan? sorry but I can't seems to find it. thanks! The Study is considered a bedroom - something that is common with new projects these days. For a person earning $10,000 a month, one month salary buys you approx 7.5 sq ft of space. 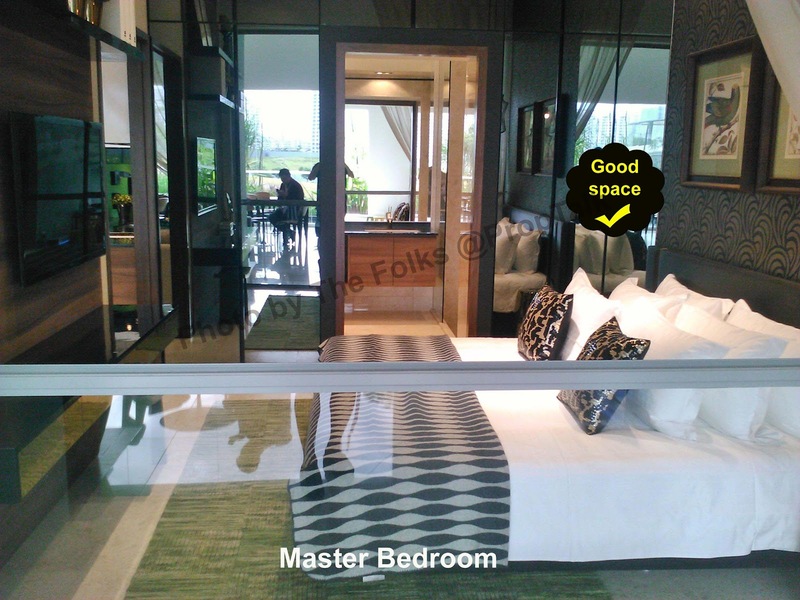 I went there last Sunday, and the agent told me a sky patio unit above 10th floor is priced at 1650Psf after all discount,and he also warned the special discount of 3% (it was 5% during initial launch) will fade soon, so I have to pay above 1700psf if I dont rush. What I don't understand is why government meassure cannot brake out private developers like feo, and why local people buy like crazy? Is it a serious sign of coming slump? FEO probably gave steep discounts initially to entice buyer mentality for the project and give it a strong start..
once they break even on the project, they will stop the discounts and then hold out until valuations meet their asking price. 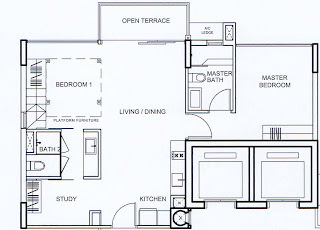 btw, i also saw the 3 BR Compact SOHO at this project, and was quite charmed by the unit layout. Quite suitable for young family - Parents to stay in the MBR, young children to stay in the Loft beds outside as they need less privacy. Prices look pretty reasonable after discounts but i did not bite as I am quite sceptical about the long TOP period - TOP in 2016. Wonder if I can collect better bargain if economy starts to slump down and shakes off some weak buyers..
DC for non-landed residential sites is lowered! Bartely Residences: 65 units sold on preview! Terrace house for rent, anyone? 2H11 GLS: The "High" and the "Low"
Revenge of the "En bloc-er"..? Enbloc News: Crystal Tower...Take 3!